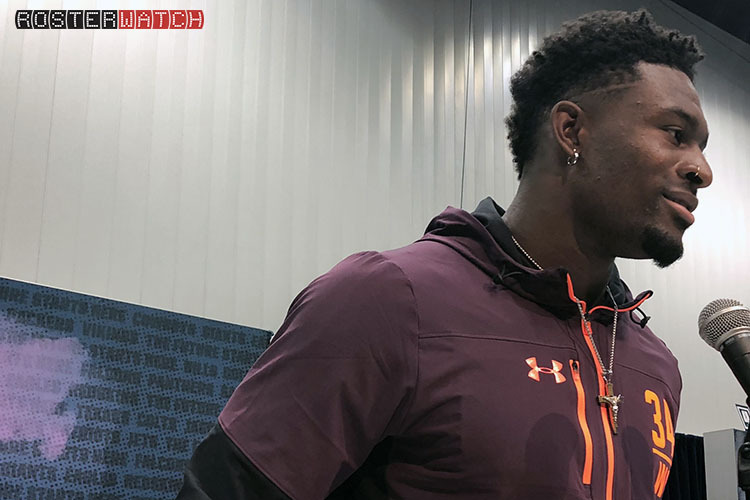 Scouting Notes: Metcalf is 6’3”, 228 lbs and runs a 4.33 second 40 – What else do you need to know? In truth, that is all that some teams need to know about him, but let’s dig a little deeper, just for fun. Yes, it’s hard to look past Metcalf’s unreal physique. He’s a comic-book superhero come to life – If the Black Panther could be recast, he’d have the edge over anyone in Hollywood. He gets his genes from his dad Terrance, who was an offensive lineman in the NFL. But unlike so many prospects with similar physical traits, D.K. can move all that muscle more quickly than 99% of his peers – at least in a straight line, that is. Metcalf is just not going to get beat on go-routes or in any situation where it’s left up to a foot-race. And there’s almost no chance he’s going to get jammed up on the line by a defensive back – He’s just too big. It should be no surprise that his best routes at the college level were by far the hitch and the go routes. Metcalf’s most glaring weakness is his inability to maneuver his body in and out of cuts with much quickness. His 3-cone drill was 2nd percentile among NFL WRs, and his 20-yard shuttle was 3rd. He did slip during his three-cone, but that alone should tell us something. Once that massive body is up to speed, it’s almost impossible to stop and takes time to get going again. Fortunately, that’s not much of an issue concerning what Metcalf is most often called to do, which is get behind the defense, catch the ball, and then blaze past or trample anyone in his way. The only thing that has been able to stop Metcalf over his college career is injury. He only played 2 games his first season before breaking his foot, and his final (sophomore) year(7 games, 26 rec, 569 yards, 5TDs) was stifled by a neck injury. He’s like a high-performance Ferrari, and if you’re familiar with those exquisite machines you know that the slightest mechanical issue can take one out of the race in an instant. Still, Metcalf’s ceiling is so high, that he’s instantly worth the risk. His freak size extends to his catch radius, and that’s a good thing, because he doesn’t have the softest hands. As a blocker, Metcalf is right where you’d expect him to be – He can easily hold back any secondary defender that tries him. Fantasy Outlook: I wouldn’t be surprised if Metcalf is the first receiver off the board on draft day. He’s not close to the best option based on skill, but he’s a once in a decade size/speed combo at his position, and for that reason only he’s going to be one of the first receivers taken. Metcalf has boom or bust written all over him, once he gets to the NFL. He could be the next Julio Jones, except even bigger AND FASTER, or he could be the next Breshad Perriman – a size/speed freak who has never been able to get past nagging injuries up to this point in his career. Either way, you have to take Metcalf early and often in drafts, because despite his rawness he’s going to be on the field early and often as a deep option and red-zone lightning-rod, no matter where he lands. He has the potential to a top 5 WR in any format. Q: Were you surprised what a stir that (muscle) picture on Twitter caused? A: Little bit I didn’t think it was going to explode like that. Q: How many different people to hear from after that? Q: Despite getting bigger, how do you feel you’re going to run tomorrow. A: You’re all just going to have to wait and see. Q: What do you say to people that say it’s Photoshopped? A: There’s no photoshop in that picture. I know the work I put in so I’m not worried about what other people are gonna say. Q: How much did training at EXOS and working out with your teammate (A.J. Brown), how much did it help? the biggest tryout of our lives. Q: How intense was the competition there? A: It was always intense. We were always competing at everything at EXOS so you know it brings out the best in anybody. Q: How would you like to play with a quarterback like Baker Mayfield? A: Just to play with quarterback like Baker Mayfield is going to be great. You know, it’s just another blessed opportunity just to get drafted by the Cleveland Brown organization so I’m gonna take it one step at a time right now. Q: Do you know your real body fat? A: No, I don’t. I read it. It said 1.9 yesterday. Q: Were you into weight lifting all through high school? Did your father play a role in that? A: My father was actually on the coaching staff in high school, so he was always there around me. Q: A.J. Brown was talking earlier about the diet. What was the biggest change in the diet. A: At Ole Miss, we ate however we wanted to. At EXOS they really cut down on bad foods for you, like high-sugar, high carbs, and they really honed in on proteins and vegetables and all of that. A: Well everybody looks up to their dad when they’re in their lives, so just blessed to have a person that actually did everything that I’m going to now. So it’s like having a cheat sheet to life. Just listen to everything he’s taught me. He’s still talking to me now. How is it? Checking in on me so, it’s just a blessing just to have him with me. Q: What’s the most important football lesson he’s taught you. A: Your hard work is always going to get noticed somewhere. If it’s not getting noticed early, somebody’s going to notice along the line. Q: What remember about being around the Bears locker room with your dad? A: I know in ’06 before they went to the Super Bowl, I actually got a chance to go in the locker room after they won the NFC Championship so that’s like a memory that stuck with me a lot. I got to hold the NFC trophy. And like I say, just to be there in that setting, it was great. Q: Just to clarify, you’re no relation to Eric Metcalf at all, are you? A: Eric and Terry are my my cousins. Not my uncle or grandfather. Q: Are you in any kind of contact with Eric? A: My dad is in contact with both of them. Q: Have you ever talked to Eric about the Cleveland Browns? Q: With all those football players in your family, at their peak, who was the strongest player in your family, your dad, cousins, you? A: I’m gonna say me everyday. A: Just take it as a grain of salt, everybody’s gonna talk about you, whether you’re doing good or bad. So, just keep your head down and just stay focused and keep working. Q: What do you think about people who say you’re too big for receiver, like it could be a negative? A: They haven’t met me yet. They haven’t seen ‘too big’ in seeing what I can do on the field or as a 40 or bench 27 reps, they haven’t seen me yet, so you know they can compare me to other big receivers that have been unsuccessful but like I say, they haven’t seen DK Metcalf. Q: Dad ever try to push you into OL as a little kid? A: No, I’ve always played wide receiver. Q: How much different is your body now compared to way it was at Ole Miss? A: Very different. I came into Ole Miss at like 5% body fat and then when I got to EXOS it was just slowly dropping. Q: How big do you want to play in the NFL. A: Whatever the coach needs me to be. Q: What’s the best part of your game? A: 99-1 balls I call them. The 1% I’m not coming down with it, it may be a bad ball by the quarterback. Q: Who do you identify with in the NFL? A: I don’t like to compare myself to other people because you know they’re not me, but I look up to Julio Jones and Calvin Johnson a lot. Q: How do you use your size as an advantage? A: Anytime I got a smaller corner, I’m going to use that to my advantage to you know get him, use my big body to go up and make them help me make the contested catch. Q: Pretty much every corner is smaller. A: Pretty much, but Carlton Davison from Auburn two years ago, he was a big corner. Q: So, how often are you asked about injuries, what do you want to know about, about them and about your health now? A: I’m asked about my injury a lot. Because a lot of people don’t know that I got cleared on January 22 to have full contact and you know like I said it’s just a blessing just to be able to play the game of football again. Q: What’s the relationship like with you in A.J. A: From playing A.J. in high school to being a teammates and college to both living our dream here at the combine, I mean it’s just great. And just a person that I can just look to in hard times because we’re going through the same thing. And he may be going through the same thing with me. So I’m just looking to him as a brother in this processes and it’s a great experience. Q: X position, what separates you from other guys? A: My favorite part about playing the X position has to be the one-on-one matchups and the fact that I could either block my person to the sideline or go up and make the contested catch, is what really excites me. Q: Best receiver in this draft? And what separates you? A: I see myself as the best receiver in this draft, because I’m a competitor and I’m going to compete every day. Q: Which team interview has stuck out. A: The Redskins. They really honed in on my on my film and taught me something that I didn’t know about myself watching film. A: I don’t get out of my breaks like I need to. A: He told me that when I get there, just to continue to be the person that I am today and just to continue to work hard. Q: Things that you learned EXOS, is that for the rest of your career now? Q: So when are you going to drink strawberry milk again? A: I gotta give it up. Q: Most memorable moment of your career. A: Just the players and teammates and the friendships that I made along the way. I played with some great players, Greg Little who’s here, A.J., just to name a few. They’re going to be my boys for the rest of my life and just to have opportunity to continue to play with them in the NFL is is gonna be great. Q: Your physique, Do you feel like there’s gonna be some pressure to play with a level of physicality that matches up to the way you look. A: I mean yeah, but I can incorporate a little finesse in my game as well, so I’m not worried about that.